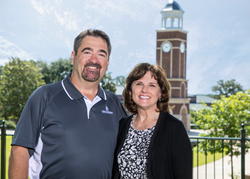 Tony and Tamie Torres, FHU's new dining service managers. "Together we’ll create a home away from home culture that also provides new and exciting opportunities; we understand that meals on campus play a major role in their college experience." The couple is moving from Middle Tennessee to Henderson to lead FHU in bringing dining services under the university umbrella beginning June 11, 2018, for the first time in many decades. The couple brings decades of hospitality and customer service experience to university dining. Tamie Torres, who will be dining services director and catering manager, has proven herself with diverse audiences — from operating her own catering business in Lemoore, California, to serving as banquet manager for the Hutton Hotel in Nashville. In addition to decades of dining service work, Tony Torres has built his reputation for service through Tony’s Tours (the couple’s national and international tour company) and catering work for small groups and thousands of people. Their clients have ranged from at risk youth to senior citizens to company employees. He will be dining services general manager for FHU. The mission of Freed-Hardeman University is to help students develop their God-given talents for His glory by empowering them with an education that integrates Christian faith, scholarship and service. With locations in Henderson, Memphis and Dickson, FHU offers bachelor’s, master’s, specialist’s and doctoral degrees. To learn more, visit fhu.edu.